Fatty acids are essential contributors to adipocyte-based non-shivering thermogenesis by acting as activators of uncoupling protein 1 and serving as fuel for mitochondrial heat production. Novel evidence suggests a contribution to this thermogenic mechanism by their conversion to bioactive compounds. 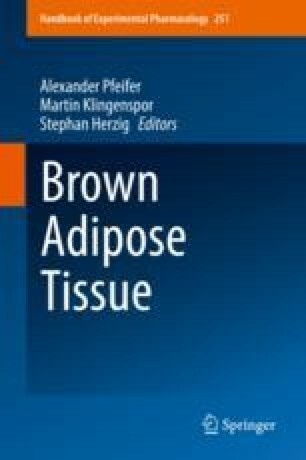 Mammalian cells produce a plethora of oxylipins and endocannabinoids, some of which have been identified to affect the abundance or thermogenic activity of brown and brite adipocytes. These effectors are produced locally or at distant sites and signal toward thermogenic adipocytes via a direct interaction with these cells or indirectly via secondary mechanisms. These interactions are evoked by the activation of receptor-mediated pathways. The endogenous production of these compounds is prone to modulation by the dietary intake of the respective precursor fatty acids. The effect of nutritional interventions on uncoupling protein 1-derived thermogenesis may thus at least in part be conferred by the production of a supportive oxylipin and endocannabinoid profile. The manipulation of this system in future studies will help to elucidate the physiological potential of these compounds as novel, endogenous regulators of non-shivering thermogenesis. This work was supported by French Agence Nationale de la Recherche and Deutsche Forschungsgemeinschaft (ANR/DFG-15-CE14-0033 “Nutribrite”). We thank Tobias Fromme for proofreading the manuscript.